Our trip to Steamboat Springs, Colorado was one of the best trips of my life! In fact, it was so jam packed with awesomeness, I decided to split it up into 2 posts. The first post will show you all the fun things we did, and the second post will be focused on the absolutely amazing wedding we attended. So, we arrive in Denver and have a 3 hour drive up a mountain to Steamboat. Good thing our rental car was equipped for mountainous driving. Oh wait...it was a negative 4 cylinder engine Nissan Versa. Vicki the Versa was a little creaky but she made it there and back just fiiiine. Without most normal amenities, but who is complaining. Thanks for a safe trip Vicki! I'm not one for road trips (read: can't sit still and very easily bored), but these gorgeous views held my attention the whole way there. We stopped halfway in the adorable town of Frisco for a rest stop (read: bison burgers and beer). In addition to skiing and outdoorsy-ness, Among many other things, Colorado is known for superb craft beers and I probably tasted them all. When in Rome and all...! When we got to Steamboat (read: new favorite place on Earth), we pulled up to our fabulous hotel, the Steamboat Grand. Pretty grand view, right? That night we went out on the town with some peeps and I ate this delicious plate of food at Carl's Tavern. This here is what you call a chicken pot pie. As I told the waitress (I ask a lot of questions at restaurants, Mr. Fo loves this quality), I was drawn to the chicken pot pie but I'm not a "chicken pot pie person." She told to get it and I did. And that was history as I'm now a chicken pot pie person for life. The next day we checked out the gondola and decided to buy tickets to a Sunset Happy Hour at the top of the ski mountain. It was SO fun. A little scary, but fun. Here I am at the top of the mountain...just chillin'. Side note, zero humidity is simply excellent for my hair. I'd move to Colorado for that alone. We did some wine tasting at the top of the mountain. This wine flight was called "Pinots with Personality." So cute, right? Sunset time! Look at the pink in the background. Then we took the gondola back down at night, which was beyond gorgeous. The next day we hit up Fish Creek Falls for a hike and some nature. We packed sandwiches and water (aka lifesaving provisions), just like real hikers. Unlike a real hiker, I forgot to pack a hair band, so I had one bobby pin for the whole trip which was probably the dumbest thing ever. Who wears their hair down on a hike? Whoopsies. ...which was hitting up the hot springs. Note: The hot springs are clothing optional after dark, but you'll notice we visited in day time because we're classy like that. The hot springs were basically built up like a resort with different temperature pools and one of said pools was really. freaking. hot. The next morning we rewarded all our exercise and outdoorsy-ness with this ginormous cinnamon roll from Winonas. This cinnamon sugar concoction has been featured in Gourmet and Bon Appetit magazines, so you know I had to try it. Obv. We had to eat it with a knife and fork, literally, and we didn't finish it. Which was a tragedy. It's hard to tell from the picture, but the roll was the size of a dinner plate. It was totally fat free. 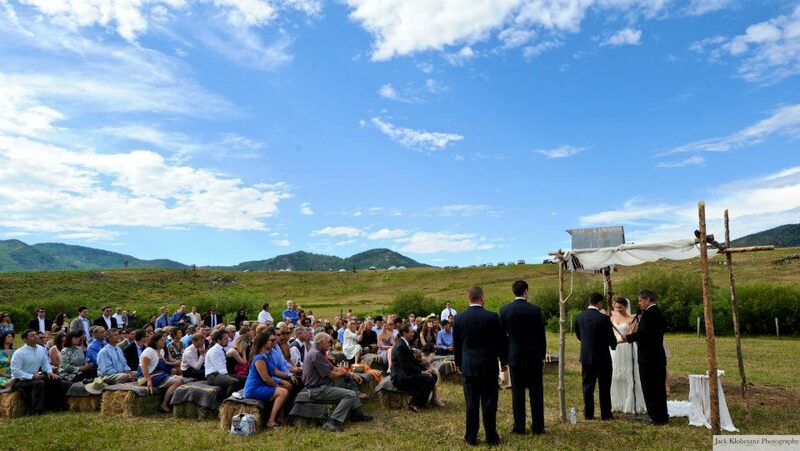 ...and a stunning ceremony backdrop complete with hay bales for seats. So tell me you're excited to see more of this fabulous wedding!!! It's coming up later this week, so don't forget to check back! Looks amazing! I love Colorado. And they sure do have some good beer there!